KEY VERSE : But thanks be to God, who gives us the victory through our Lord Jesus Christ. BIBLE READING : Philippians 2 vs 6 - 11. Victory is ultimately something that comes from the Lord. Victory means God's Will prevailing to His Glory. Allowing God's will prevail over your life means victory. Our Lord Jesus Christ, while on earth found Himself in a very discomforting situation. But instead of feeling depressed, HE allowed God's will to prevail(Matt. 26 vs 39). 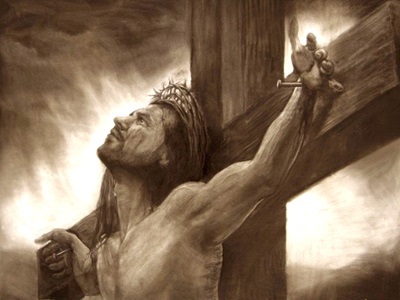 This is why HE took upon Himself the form of a servant, and became obedient to death so that you and I would be saved. You see, enduring the cross was God's will for Jesus. 'Heb. 10 vs 7' "Then I said, 'Lo, I have come to do thy will, O God, as it is written of me in the roll of the book". Jesus took the punishment we deserve and offered us His righteousness. And because of His obedience and submission to the Will of God, He received all power both in Heaven and on earth. (Matt.28 vs 18, Phil. 2 vs 10). Therefore, everything is subject to His authority. (Phil. 3 vs 21). Dear friends, everything you need and you'll ever need is in Christ Jesus. So, figuring out a way to win victory is absolutely unnecessary. We find our victory only in Christ Jesus. If we are in Christ, we potentially have all victory that He has won. Note : Our "key verse" says " God gives us the victory through our Lord Jesus Christ". It is only when you allow Jesus to become your personal Lord and Savior on every level of your inward and outward life, that you begin to live in victory. Have you accepted Jesus into your life to be your Lord and personal Savior?? If not, I encourage you to do so right away.